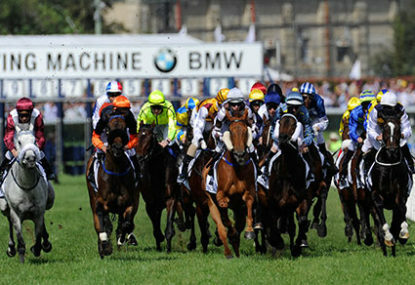 Melbourne’s autumn championship sees a stellar field of stayers lining up in today’s Australian Cup. Join The Roar from 3.45pm AEST for a full preview, live blog and post-race analysis. The Australian Cup has drawn a disappointingly small field but packed in that field a plenty of talent, including the two most recent Melbourne Cup winners in Fiorente and Green Moon. Fiorente leads the market as the deserved favourite after a comfortable win in the Group 2 Peter Young Stakes where he has picked up where he left off in spring. Showing his clinical turn of foot, the punters assume he can only get better as he steps up in distance. Throughout the years, Melbourne Cup winners have had an excellent record in this race and Fiorente looks likely to continue the trend. His biggest challenger comes from three-year-old Shamus Award who was clinical in his Australian Guineas victory last week. Winning Melbourne’s spring weight-for-age championship, the Cox Plat where he defeated Fiorente, Shamus Award has to be given a huge chance and the bookies certainly think so too. The biggest query will be whether or not the colt can back up off a seven day break to take down Fiorente who comes of the standard two week break. As the likely leader, Shamus Award should have no problem finding his way to the front to be the bunny they try to catch. The 2000m here looks ideal for the youngster who will stake his claim for best horse in the country if he can upset the older stayers here. Everyone loves seeing three-year-olds take on the older horses and Shamus Award is joined by Thunder Fantasy who too is backing up from the Australian Guineas. Mark Zahra couldn’t get out with Thunder Fantasy until quite late in the race and was one of the strongest to the line to suggest the colt will appreciate the added 400m on offer here. He may not be proven in this company but he is the biggest wildcard in the race and should have no problem travelling the trip after running fourth in the VRC Derby. Foreteller was his honest self in the Peter Young but couldn’t get going until it was too late. He returns to Flemington where he claimed the Group 1 Makybe Diva Stakes in spring but he has failed to finish ahead of Fiorente in the two times they have met. Mourayan turned the clock back two weeks ago when he finished second to Fiorente in the Peter Young and is another who gets better with distance. However, his lack of consistency makes it quite difficult to back him and his stablemate Green Moon is the better chance here. Voleuse De Couers is the most interesting runner in the field but the bookmakers give her no chance. Purchased for a hefty price following her five length win in the Irish St Leger, she didn’t turn up in the Melbourne Cup but Mike Moroney insists she is just as good as her price tag suggests. She has a good first-up record but with barely any rain in Melbourne over the past fortnight, she may find the ground a touch too firm. The Australian Cup will jump at 4.00pm AEST.